Corner the market on goods like machine parts or bottled demons. Research steam-age technology and recruit mercenaries to control the continent. Build sea-going schooners or cloud-cutting airships to reach faraway lands and flying islands. Your cities have limited capacity, so you’ll have to decide what to keep and what to demolish when building advanced structures. I love deckbuilding games. Even the ones I don’t like. I have fun playing any of them. I think it’s a very cool, relatively new breed of game, and I eat it up. But I can see the limitations of this type of game. They aren’t just prone to randomness; they ARE randomness. If games aren’t fun for you unless you can closely tie victory or defeat to your performance, deckbuilders are definitely not for you. Or rather they WEREN’T for you. Enter City of Iron. There is a sharp contrast between your first game and future games of City of Iron. In addition to the normal annoyances/pleasantries of cracking open a fresh box (punching cardboard (4 or so sheets in this case), unwrapping decks of cards), getting through the rulebook is an onerous task. It’s not the longest rulebook – 17 pages of content – but it’s pretty difficult to comprehend. With other deckbuilders, I’m usually able to read every other sentence and fully understand the rules (Ascension took me 15 minutes), but City of Iron is just so different (read: complicated). I read and re-read, shuffled back and forth between pages to try to piece it together. The rulebook certainly could have been better-written and organized, but it’s all there once you parse it. Then you move to the game… and you stumble around blindly, making error after error and curse the rulebook as you search for clarity. All told, I was well over 2 hours with the rules before setting up the table, and the first game took over 4 hours. But come game 2 the rulebook was a thing of the past, and I could focus on this beautiful and engaging game. The advertised time of 2 hours is about right for a 3-player game, with 2-player games running a little shorter and 4-player games a little longer. Set-up is always cumbersome: you need to organize/arrange/build several different decks of cards and arrange cardboard bits over the playing area (this is an entire-tabler). Game preparation always takes me 20 minutes. Like many games with frustrating rulebooks, teaching others is much easier. Don’t get me wrong – they will look at you like “this doesn’t make any sense” – but the “why” will click quickly when you start playing if you get the “how” down beforehand. I’d allot 30 minutes to run through the rules basics with a new player. Mechanically, the learning curve is but one game… but strategically it’s much richer. The way this game “builds” a deck is very different. You start with a pre-determined 4 cards (only 2 of them in your hand), and these are all you have until you purchase new cards out of your reserve. Do you purchase Citizen cards to enhance your building and exploration? Or do you purchase Military cards to conquer territories? Do you forgo building your deck at all this round to save up for a particular brick-and-mortar building? Regardless of route, your decision is driven by resources – you amass the victory points necessary to win by having the greatest access to resources, and your cards (or lack there-of) exist only to maximize your resource-gathering ability. But what type of resource do you go after? Do you try to monopolize cheaper/more abundant resources? Or try to hit pay dirt with one or two rare resources that your opponents can’t nab? And I haven’t even mentioned that you can use your money to bid for turn order each round if you choose. Or Science. That’s a thing too. There’s an insane number of routes to victory here, and only properly executing on a sound strategy will get you to the promised land. I’d say the strategic learning curve is dozens of games. I’ve had to force this game on everybody. Even with the steampunky theme and awesome art, my friends would rather re-play old favorites than jump in to something new that’s this complicated. But once I force them, it appeals to nearly everybody. There is a heavy Euro game here… but it’s theme rises above all… and deckbuilding is its principal mechanic. I’ve converted the Ascension and DC DBG freaks in my group, and found a card game that the fiercest strategy gamers can appreciate. But this is definitely a stretch for casual or social gamers. There’s a lot of thinking and planning going on, and it only supports 4 players. There is a military aspect to the game that can’t be ignored – the military deck has a gun on it just to make sure you know exactly what it is, and exactly what you’ll be doing with it. And if you utilize a strategy based around it, there’s little doubt that you’re invading and conquering sovereign townships. But there isn’t any direct violence. There’s no coarse language or adult themes on cards. It even manages not to objectify women (HOORAY! This is shockingly hard to find in board and card games with beautiful art… women are equal and powerful here, but not “eye candy”). Finally, the game is not as reading-dependent as other deckbuilders; words are kept to a minimum on cards and symbols are utilized as much as possible. But I still couldn’t see playing this with a child under 12 or so. It’s just too hard to grasp, and the “thinking” necessary too demanding. City of Iron is the most evolved deckbuilder I’m aware of. If your entry-level/gateway deckbuilders are Dominion, Ascension and DC, and your tier 2 deckbuilders are Thunderstone and Legendary… this is probably tier 4 or 5 (yes, I left tier 3 unoccupied… such is the distance between City of Iron and common deckbuilders). The only deckbuilder I’d place near City of Iron in the deckbuilding hierarchy is Fantastiqa, but they are remarkably different games with only the deckbuilding mechanic – and hard-to-follow rulebooks – in common. If you like complicated card games or Euros, City of Iron can’t miss. Don’t be scared off by the “deckbuilder” label… this is how you make a deckbuilder for strategy gamers. Not only do you look through every card and decide which go into your active deck, but you get to decide the ORDER they go in. There is literally no shuffling in this game. If you lose, you have only yourself to blame. So far, City of Iron has been one of my favorite new games to break out at the game store, or with friends. Many of descriptions of it classify it as a “deckbuilder”. It is barely a deckbuilder. What it really is, is a medium-length euro game with a card draw mechanic thrown in. In City of Iron, you are one of four races trying to build cities and collect resources, and explore a steampunk/magical world. Each race has a slight unique power that differentiates them, but they mostly play the same. You start with a plot of land, which can hold 5 structures. Structures are made up of cards, which can be purchased from the pool of available structures each round. Some structures give you income on your turn, some give you victory points, and some give you resources. The game is divided into a variable number of “rounds” each of which is three phases. In a round, players get three actions, taken one at a time in turn order (which is decided upon by bidding for turn order at the start of the round). Each action is something simple, like building a city, collecting taxes, drawing a card, or playing a card. Following the actions, you collect money, refresh the pool of available cards, possibly collect VP, draw cards, and buy new cards for your deck. Buying cards for your deck is where the deckbuilding component comes into the game. Each player has a personal military and citizen deck on their player board, as well as a stack of unpurchased cards next to them. At the end of the round, you can look through the cards, and purchase any card you want to add to your hand, by paying the cost listed on the card. The cost is one of the two currencies in the game, gold, or science. There are both citizen and military cards in the deck for you to choose from. The citizen cards offer different actions, such as getting science cheaply, taxing for more gold, or exploring. The exploration action can be used to “discover” new lands. There is a pool of available lands set next to the board, and as an action, you can use an explorer card to take one of these lands and add it to your board. This gives you more space to build structures, as well as the ability to build certain structures that cannot be built on your starting board. Each land has a distance, and sometimes a special icon, airship or boat. When playing the explorer, you also need to play other cards from your hand that have a “distance” icon on them, to have enough distance to reach the new land. If the land has an airship icon, you also need to play a card with an airship on it. You also have military cards to choose from. These cards give you an attack power, as well as sometimes having distance icons. Attack power can be used to conquer independent towns that are laid out next to the main board. The towns offer a different path to building your empire other than buying structures from the main pool. When you conquer a town, it is placed next to your player board, and flipped over to the conquered side. When this happens, the defense of the town increases. Other players with military can attack your towns (but only your towns, not your purchased structures) and take them from you. The deckbuilding component is pretty small in this game. You rarely end up with a “deck” of more than about 12 cards. One nice mechanic is that you can always look at your deck to see what is coming next. However, the order cannot be changed. When you run out of cards in your deck, you do not shuffle the discard pile, instead, you simply flip it over. This means you can plan out future turns by thinking ahead and playing your cards in a specific order, so they draw back into your hand in a way that benefits you. Structures and towns generally provide resources. On the board, there are a variety of different resource tracks. The resources in this game really add to the theme of the game, and add a lot of fun. Resources such as “bottled demons”, “tentacles”, “gears”, “magic crystals” will make you smile. A structure or town might add 1-3 of a given resource to your pool. For example, if you build a turnip farm, you would gain 3 turnips. You would advance the counter on the turnip track by three, and also advance your income track by one. At the end of the round, whoever has the most production of each resource in the game, gets a bonus income for that resource. Additionally, on a scoring round, that player also earns victory points. There are three scoring rounds in the game, A, B, and C. The structure deck is composed of three sets of cards, of increasing value and cost. Each set has a scoring card mixed in. When the scoring card comes out during the end of round refresh of cards, everyone will score VP at the end of that round. Because of this, the scores in this game are generally pretty low, and the fight for first place is pretty tight. Winning scores of about 20-30 are the norm. Overall, this game is an absolute blast to play. There is virtually no luck involved in this game whatsoever. You bid on turn order each round, so if you want to go first, simply pay more gold to do so. The decks are purchased by you, and the draw order is set by the order you play the cards, so you know what is coming out. The available structures are laid out prior to bidding on turn order, so you know if it’s worth paying more to go first. This game is all about strategy, and paying attention to the other player’s position on the various tracks. If you don’t want to get into a military battle with other players, you don’t have to, simply don’t attack towns. A 3-4 player game generally lasts about 60-90 minutes. Each round will have you thinking very carefully about what to do next, and planning out your moves. I find myself wanting to play this game over and over, to try new strategies out, play different cards, build different structures, etc etc. After many plays of the game, I still don’t feel that I’ve mastered it. That makes it a great game in my opinion, as it keeps me coming back to try again and learn more. Beautiful artwork and components. Wonderful theme. Low scores keep every game tight, and the final counting of VP is always exciting, as you don’t know if you’ve won or not until the very end. Game sometimes feels a little short, you wish there was just one more round to pull off a final action. Lack of planning can really kill you in this game. If you don’t think ahead a bit, you can find yourself unable to do any real action on your turn. Setup is slightly complicated at first, but gets easier once you’ve played once or twice. Nation powers are very slight. There isn’t much difference in the nations you pick. They are balanced well however IMHO. Overall, great game. I will play this over and over and love every minute of it, win or lose. I purchased it because I thought it was a deckbuilder, but was pleasantly surprised to find a deep and exciting euro game instead. In this resource management Euro you are one of four race leaders trying to build up your cities and conquer towns in order to be the supreme of them all… wait, did I just mix it up with American Horror Story: Coven? Right, dial it back. But really you are either the frogmen, the hogmen, the humans or the mother of dragons… err.. I mean Cresarians. The reason it’s so easy to start jumbling up tv references here is because this euro is unlike many others.. it actually has theme! No, I’m not kidding, it does, it truly does. Painted over with a steampunk anthropomorphic style you are immersed into it and start really caring about gathering turnips or silks or demons in jars. Each turn you are trying to collect the citizen/military cards needed to either build a new city, conquer a neighboring town, gather science or coin, build economic infrastructures to move goods, store buildings etc. Three times during the game a score card will come out which will give you VP at the end of that turn these are worth paying attention to as they will come up faster each time (as there are more A cards than B more B than C). Also there is a nice mechanic with the way you discard things being how you will draw them later, so be aware of this and set yourself up for success best you can. You MUST think ahead or you will fall behind. With only three actions per turn you must spend them wisely, though by buying new cards each round you can catch back up.. mildly, if someone is running away with the resource track you may need to go military and knock them down a peg to stay in the running. It’s that interaction and veneer that make City of Iron feel like a blend of Euro & Ameri-trash without needing the luck mechanic. A brilliant marriage of Euro & Theme which is harder to do then one might think so kudos to Ryan Laukat on that. What I like: Thinky & Pretty. The art style is amazing, the game flows easily and is easy to follow once you play through once. Scales well at 2,3 & 4 players equally. What I dislike: Board is beautiful but too big for what it is. Could have shrunk it down to make more table room for play areas especially the banner art between the resource scoring and VP track. Who it’s ultimately for: Those looking for an intro to mid-weight euro games with Ameri-trash veneer. Who it’s ultimately not for: Ameri-trash purists. This has 98% no luck, I’d give it 2% just based on the shuffle of the deck and what comes out when but that’s it. This game has me torn! On the one hand I really thought this was a well made game, but then the type of strategy required to play isn’t one that I’m great with. But it’s also a deck builder! I love deck builders! Let’s take a look at the setting and game play to help me focus my thoughts..
You play as a fantasy race in a steam punk inspired world that is trying to develop your small nation into the most powerful nation. In order to do this, you need to manage money, resources, land/towns, and a military. If this is your first time playing, the rule book is confusing, so tack on an extra 30 minutes at least of playing time, maybe even an hour. This is a game you just kind of need to start playing and go back to the rule book as necessary. On each turn you have a lot of options that you can take. However, once you do a turn or two, it all is pretty intuitive, you just need to remember your options! I tried writing down a detailed look at the game play and gave up after the fourth try! I understand why the rule book is so confusing. So, what follows is a super simplified version. The object of the game is to have the most victory points at the end of the last age. You get victory points by having more of one type of resource than the other players. There are also certain cards that give you victory points. Each race has a special ability and a special citizen card, the rest of the citizen/military cards are the same. You can play with or without the special abilities and special cards. You start the game with 2 citizen cards, your special card, and a military card. Citizen cards help with getting money, knowledge, extra actions, etc. Military cards help with taking over towns and exploring new territories. At the end of your turn you can buy more cards to put into your hand. You get money through purchasing resources (which are randomly drawn and placed in a row each turn) and certain citizen cards. You need to expand your territories so that you can build special resources and have more room for your buildings. -Very unique blend of resource, land, and money management, but also building a deck. -The game builds on itself with the ages. Everyone starts out small, and needs to grow and develop in a balanced way to keep up. -Lots of strategy. You need to balance resources, money, knowledge, citizen and military cards WHILE planning for future growth. There is a lot going on. There are just so many options here. -While there is some military in the game, it’s not THE main part of it. This isn’t a “I gotcha!” game necessarily. -Very confusing at first, rule book is also confusing. -The first few times, almost too many possibilities. You may forget about certain options and then run into roadblocks because of poorly planned growth. -Possibly could be a runaway if you don’t plan growth well and others do. -Takes a while to play, and requires quite a bit of space. Sometimes I like to think I’m a strategy gamer or an avid gamer, but games like this remind me that I’m only a casual gamer. I like strategy, but I like focusing and planning just a few things. I like working with limitations. This game requires you to plan and think about numerous aspects simultaneously. With games like this this, I start out strong and then I lose focus. The type of strategy and planning required isn’t something that I really want to put that much time and effort into, so at a certain point I don’t. I think about my turns a little, then I chat up other people, and enjoy the friendly company. As a result, I am bad at this game. That being said, I still like it because I have an effect on the outcome by competing for resources and cards, raiding other towns, and blocking certain territories. So while this game isn’t necessarily a great game for ME, I can recognize this is a great game and would recommend it to most people. City of Iron has a lot of elements that, initially, feel very familiar: a track of cards that you can purchase, various goods that you are trying to get the majority of, cards depicting characters that give you various different actions. However, what struck me most about City of Iron upon playing it for the first time is that it feels unlike any other game I have played. Sure, at its core it’s just a set collection game where whoever gets the most victory points wins, but it’s much more than that. The first thing you can’t help but notice about the game is its theme. I’m not going to claim to be an expert on steampunk, but I can tell you this: This game is cool. The various goods you are collecting are not boring things like Wood, Stone, Clay, and Grain. You get to collect Glow Moss, Bottled Demons, and Srikas. Where the theme really comes out is in the Character Decks. This is also the aspect of the game that is most unique. Each player has two decks: Citizen and Military. Everybody starts with the same two cards in each of these decks (four cards total). However, after the first round of play (and every round thereafter) you have the option to purchase additional cards from your private store. Everybody has the same cards available to them (with a few exceptions, which I’ll get to) which leaves everyone to choose their own strategy. You can go all-out military and attack neutral towns (another source of resources and income) or you can focus more on exploration and acquiring new lands which gives you more space to build more buildings or you can go somewhere in between. These are all viable options. What makes these decks different than other “deck building” games is that you do not shuffle them. The order in which you use cards is the order in which they are discarded. Therefore, in order to get a card back that you just used, you have to make it all the way through your deck. You could use actions to draw cards, and sometimes you will have to, but this wastes valuable time. By exploring new lands, building districts onto your city, or building certain buildings, you can generate free card draws at the end of each round. The other thing to consider is that, unlike in many “deck building” games where you can trash cards in order to thin out your deck, once a card enters your deck in City of Iron, it stay there. This leads to a lot of difficult decisions. Buying cards puts them straight into your hand, which makes them available for immediate use. Therefore, it’s often tempting to buy an extra card or two to use either for their ability or to power another card. However, doing so can easily clog up your deck. For example, buying the Scientist is a good way to obtain 2 Science quickly, but it may get in the way when you are trying to get your Explorer back from the bottom of your deck so you can explore another land. Players also have the option of playing the game using their Race’s special powers. Some of these include additional Citizen and Military cards that are available for purchase or even in the players starting decks. These help give a different feel to each player and can assist in playing different strategies. I would be remiss if I did not mention how spectacular the artwork in this game is. Even in just a prototype stage, with not all of the artwork complete, this game is visually stunning. Each of the different building cards has colorful and vibrant artwork. The Citizen and Military decks with (I believe) have artwork unique to each of the different races. The board itself deserves to be framed and hung on a wall of your gameroom. All of this adds to the overall appeal and helps reinforce the theme. I have not even begun to explain all the different facets of the game, but I am probably not the best person to do so. Instead, I will finish by giving my thoughts on the general feel of the game. It is best to go into a game of City of Iron with somewhat of a plan. Do you want to explore new lands? Do you want to conquer towns? As I said earlier, any of these are viable options for any player, but they require many actions over the course of several rounds to carry out. However, this is also a game reactions. You could plan to stock up on cheap goods (such as Turnips and Srikas) early, but if none of them come out in the first round, you are going to have to make adjustments. Similarly, you need to adjust to the play of your opponents. Oftentimes, it is necessary to get in their way, or your opponents will get in your way. In either case, you must divert from your original plans. For example, perhaps you hold the lead in Srikas as a scoring round approaches. However, one Srika pasture shows up in the final round before scoring. If you take it, you will ensure that you hold the lead, however, if your opponent takes it, they will steal the lead from you. This is not a situation you could have forseen at the beginning of the game, you must react as the situation presents itself. The game offers a deep, satisfying experience with tough choices coming each and every turn. However, given how deep the game is, it can play in a relatively short amount of time. The rulebook states that it takes about 30 minutes per person, however, once players get used to the various cards and rules, games can go much quicker. My 2 player games have taken about 45 minutes and 4 players games only take about 1.5 hours (with 3 players games being about halfway between those numbers). Additionally, the games scales well for all numbers of players. My SO and I are always on the lookout for games like this that play well with 2 players but accommodate more than 2. This game has quickly moved up her list of favorite games to play with only 2 players. By this point, I’ve rambled enough. Hopefully something in the paragraphs above has gotten my point across. In case I didn’t, here it is: Do yourself a favor and get a copy of City of Iron. Disclaimer: I was a playtester for this game. I do not know Ryan personally and have no affiliation with Red Raven Games. I have played 15 games so far ranging from 2-4 players. 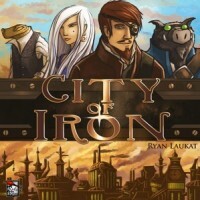 Add a Review for "City of Iron"